Geniwate transforms Stefan’s simple but elegant page_space from a little “toy,” as he termed it at the outset of the collaboration, into a poignant political space. Though this collaborative creation bubbles with interpretative potential, it is difficult not to read geniwate’s use of the rising bar structure as a visual metaphor of “escalation” and “heightening awareness” of global crisis. 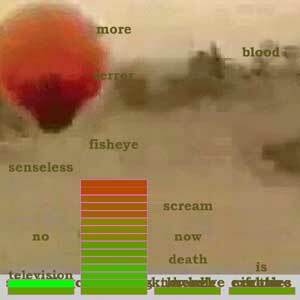 As the user distributes the words like shrapnel upon the screen one feels that a clearly defined meaning is difficult to create while urgently required.